Want to put a little “pop” into your holiday baking? 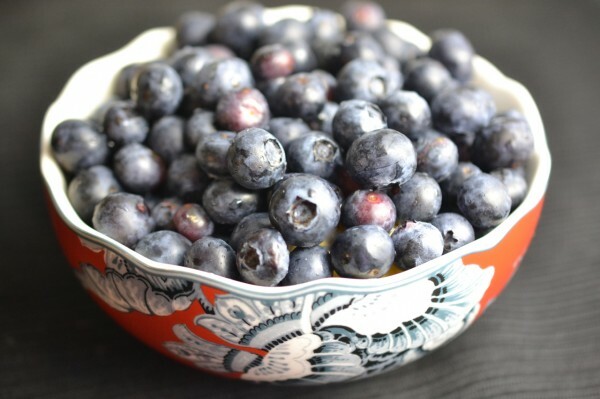 Instead of traditional reds or greens, go for blue…as in blueberries. Even though we generally associate fresh blueberries with the summertime, you can actually find them year-round in the supermarket. From April through October, they’re grown in North America, and from November to March they’re grown in South America, primarily in Chile. These “Little Blue Dynamos” are low in fat, and have just 80 calories per cup. They also contain a category of phytonutrients called polyphenols that have important antioxidant and anti-inflammatory properties. Oh, and did we mention that kids love them? Earlier this month, when we heard about the “Blueberries Meet Their Match” recipe contest sponsored by the U.S. Highbush Blueberry Council, we knew we had to get in. For our family, blueberries are kind of a special treat around holiday time and we enjoy finding different ways to incorporate them into our meals. Meanwhile in a medium bowl, sift together the flour, baking powder, baking soda, ginger, cinnamon, cloves, and salt. Gradually add flour mixture to butter mixture, mixing well after each addition. 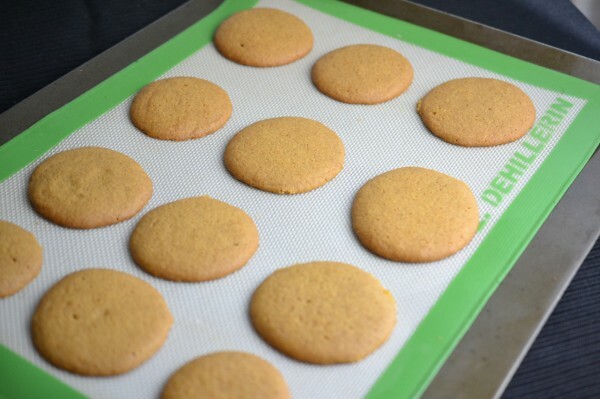 Cover two cookie pans with parchment paper or a baking sheet liner. Roll the dough into teaspoon-sized balls and drop them onto the cookie pan about 1 1/2 inches apart. Gently pat down each ball so they flatten slightly. Bake at 350 for 13 to 16 minutes or until crisp. Makes about 4 dozen. Line up the gingersnaps in pairs so that half of them have the flat side facing up. Roast the marshmallows until they are golden brown and gooey or melting. 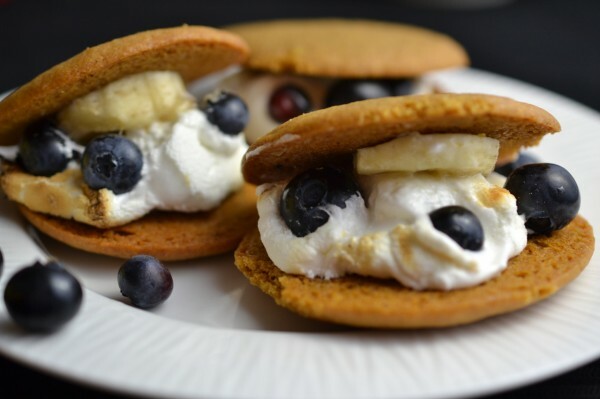 Place one marshmallow on each flat-side-up gingersnap. Gently press several blueberries into the marshmallows, then a banana slice. Top each with the second gingersnap and gently press again so that the s’more sticks together. Serve immediately. Serves 8. 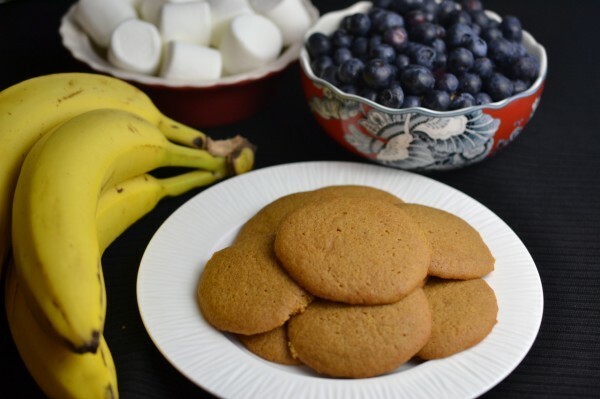 We only wrote the recipe for 8, but you can certainly expand it to use up the entire batch of gingersnaps if you need to accommodate a crowd. And believe us, they won’t sit around uneaten. 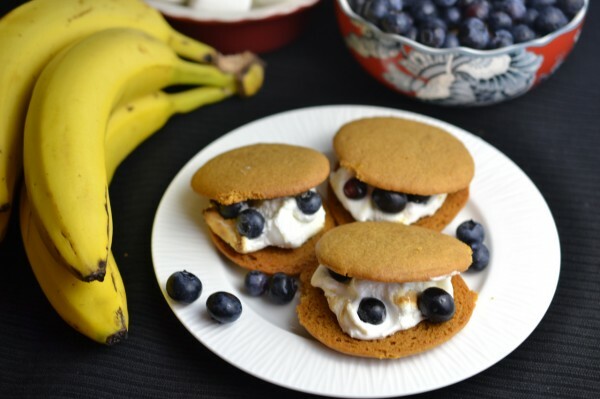 See how the marshmallow holds in the bananas and the blueberries? It’s the perfect tasty combination. Don’t be surprised if some sticky little kids (and big kids) come around asking for seconds. Happy eating!